Did you realize that within Napa Valley, there are 15 sub-appellations or AVA’s? You can actually buy a wine (if you can find it) that uses a bit of wine from 14 of the districts within Napa. I don’t know if the latest vintage includes all 15 or not. I’m curious, how many can you name without assistance from Google. If you’d like to read up more about them, click here. So, the wine I’m going to talk about in this entry comes from Oakville. FULL DISCLOSURE: I received this as a review sample. The title of this entry reflects not any particular influence from the AVA, but a play on the fact that it begins with the word oak. 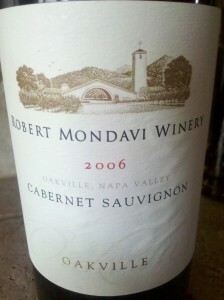 The 2006 Robert Mondavi Oakville Cabernet Sauvignon (15% ABV and SRP of $45 though I’ve seen it online for $29.99) sees a good dose of oak, with an extended period of 18 months in 70% new French oak. That my friends, is a lot of wood and it shows in both the nose and taste of the wine. The blend is 89% Cabernet Sauvignon, 6% Cabernet Franc, 2% Malbec, 2% Merlot and 1% Petit Verdot. The juice is 86% sourced from the famous To Kalon vineyard, with the balance from surrounding Oakville Bench vineyards. Other technical details I found of interest were the wine and must are gravity fed (gentler on the wine), the juice saw an extended maceration period of 36 days (to soften the tannins) and they use a basket press, which is supposed to be gentler as well. No doubt, they want (and succeed) to preserve the ripe fruit flavors they get from the grapes. I decanted this wine for 3 hours ahead of time and it could have used another hour or two if you want to soften the tannins even more. Honestly, they were fairly polished and velvety to me. You smell an obvious amount of oak, along with extremely ripe fruit. If you don’t like the modern style of California Cabernet, run away. On the other hand, if you dig that style (check me in that column), you will find all the lush velvety fruit you’ve come to enjoy from Napa Valley Cabernet. Loads of blackberry, black cherry and plum, enveloped by a spicy blanket of cedar (that sounds uncomfortable). Paired with steak and baked potato, there was plenty of richness in the food to soften the tannins, but even a few sips after finishing the meal revealed no harsh astringency. Overall, this rates a BUY for me, based on comparisons to other comparable wines from the region. The marks against this wine came primarily from the touch of heat in the nose (it is 15% ABV after all) and the lack of real complexity, though I will say this wine still has several years to develop. I’m not one to sit on Napa Cabs, as I enjoy them in their fruit-in-your-face youth. I think that is what Napa delivers best and while some wine geeks may disagree with me, that is fine too. P.S. This wine rates quite well with the professionals, including a 93 from Wine & Spirits, 91 from Robert Parker, 90 from Connoisseur’s Guide to California Wine, 90 from Wine Spectator and an 89 from Wine Enthusiast. While I agree with them in this case, that doesn’t mean you will. P.S.S. If you want to see Wine Spectator’s full list of Top 100 Wines for 2010, click on this link before November 29th, as the free access they are giving will be cut off by then.